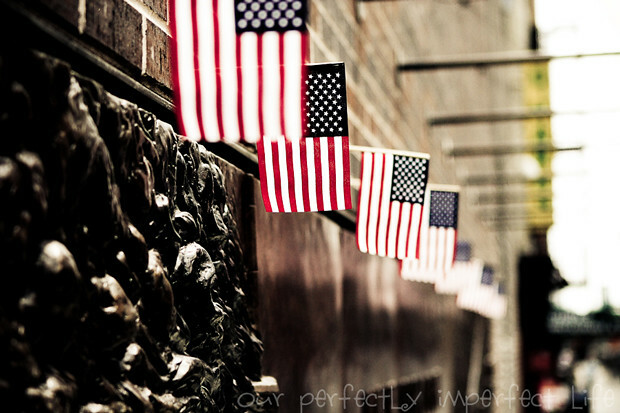 our perfectly imperfect life: we will never forget. exactly 10 years ago today. i was in my car alone... driving to work. just another morning in metropolitan DC. i hear on the radio that an airplane has just crashed into a building in nyc. come to find out it was the north tower of the world trade center. i remember being taken aback... wondering how a mistake like that could happen. i remember calling my aunt to ask if she had heard the news. a second airplane has just crashed into the south tower of the world trade center. The South Tower of the World Trade Center explodes in flames after being hit by the hijacked airliner now universally known as "the second plane," United Airlines Flight 175, September 11, 2001. This photo -- with its black smoke; the shocking, brilliant, colossal flames; the cloudless sky; the beautiful Brooklyn Bridge flying the American flag -- captures so much of the story of the day that, if one were to create a composite picture to illustrate the idea of "9/11," the result might look very much like this astonishing shot. i continued on to work. i realized at this point that this was no mistake. i did not know how to make sense of what was happening. In a scene repeated with terrifying frequency as flames engulfed the top of the towers, a man falls (or leaps, as was evidently the case with many victims) to his death from the World Trade Center. On the morning of September 11 photographer Richard Drew, in the midst of another assignment, got the call to drop everything and head to the World Trade Center. As soon as he arrived downtown he began shooting; later in the day, as as he processed what he had shot, he was especially struck by this photo -- and with reason. One of the most recognizable pictures made on 9/11, the image from a purely photographic perspective is breathtaking: the miniscule human form caught against the massive, abstract background of the towers is so obviously helpless, and doomed, that we're tempted to reach out our hands to try and cradle the tiny anonymous figure. And while Drew himself refuses to conjecture about the man's identity ("I prefer to think of him as a sort of Unknown Soldier," he told LIFE.com), it's impossible not to put ourselves in the falling man's place -- with all the dread and empathy that that sort of transference commands. 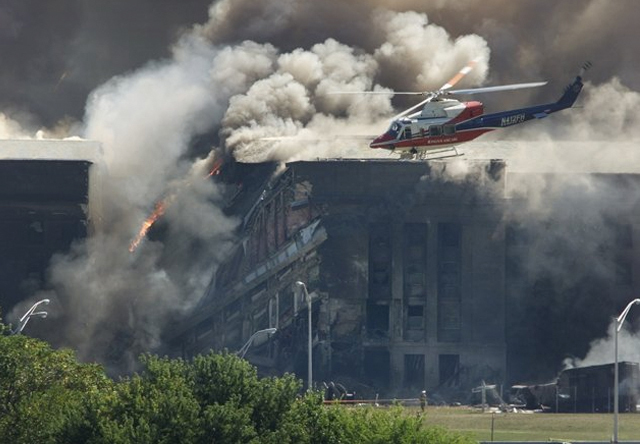 hijacked flight 77 crashes into the pentagon. i stood with co-workers in the conference room at work watching the news coverage. the pentagon was just two miles away... a short five minute drive. my husband worked in a hotel that looked over the pentagon. there was a cellphone blackout. and i could not get a line to reach him. i panicked... along with everyone else that could not reach their loved ones. i finally reached my husband on the phone. They have our hotel on lock down. I cannot talk and I do not know when I will be home. if there is ever a time that you trust in the Lord. i drove to my aunt's house... our entire local family met there. we sat and watched the television in shock. hijacked flight 93 crashes into a field in pennsylvania. This image (another by Stan Honda) is an exemplar of a strange, wrenching sight witnessed by innumerable people in New York on the morning of September 11: A survivor, layered in eerie, white dust, trudging away from the cataclysm. The man, Edward Fine, was an owner of an investment and public relations firm; he was on the 78th floor of 1 World Trade Center when it was hit. 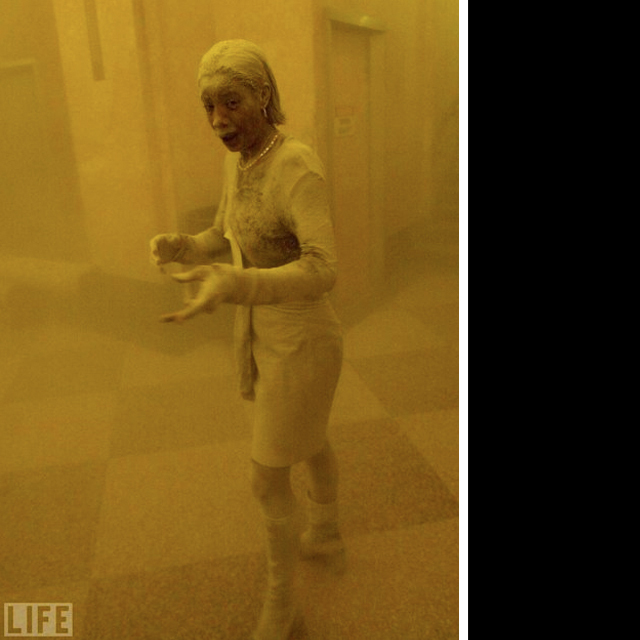 Stunned, frightened Marcy Borders, 28, is covered in dust as she takes refuge in an office building after one of the World Trade Center towers collapsed. Borders was caught outside on the street as the cloud of smoke and dust enveloped the area, and raced into the building seeking shelter -- a building into which freelance photographer Stan Honda had also fled. "She was sort of this ghostly figure," Honda told LIFE.com, "covered in grey-white dust, and I thought that this was an amazing thing to see, that this would make an important picture of what was happening out there." Of all the images from 9/11, Honda's picture is perhaps the most immediate representation of the collective and individual shock felt by those who were actually there, in lower Manhattan, when the towers fell. 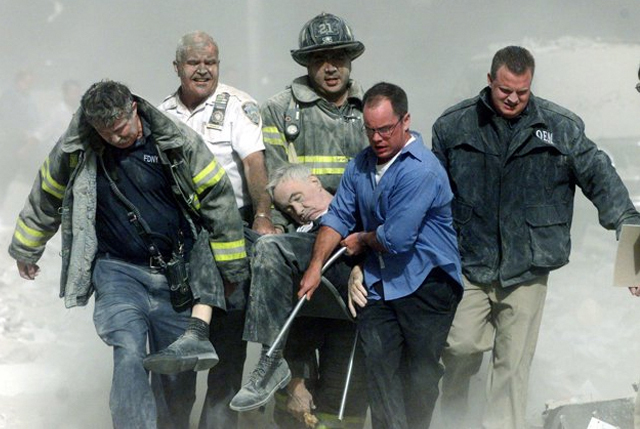 Rescue workers carry mortally injured New York City Fire Department chaplain Mychal Judge from the wreckage after he was killed by falling debris while administering last rites to another victim. A Roman Catholic priest, a recovering alcoholic, a gay man, and -- as an FDNY chaplain a spiritual adviser and trusted friend to countless firefighters through the years -- "Father Mike" was the first recorded victim of the September 11 attacks. Photographer Shannon Stapleton's picture, which burns with immediacy and yet somehow feels composed, almost painterly, captures much of the day's intense incongruities in one sombre frame: the intimacy of witnessing a single death in the midst of a monumental catastrophe; brilliant sunlight shining on the chaplain's lifeless hands; devastated first responders shrugging off exhaustion, racing to the aid of helpless victims. Here is the best, and the very worst, of that day. as i sit here this morning watching memorials on television... a tear falls. amazing grace is being played beautifully right now by a flutist. 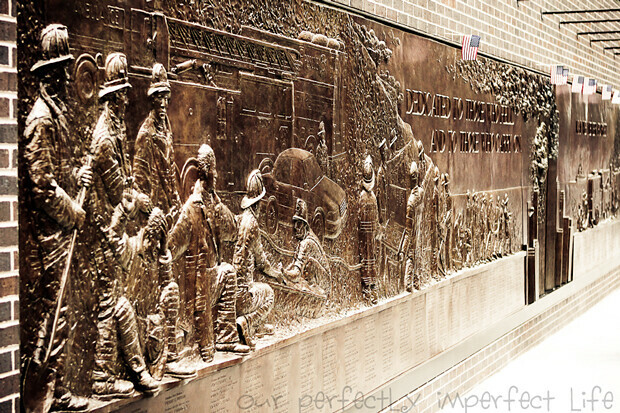 On 9/11, the New York City Police Department lost 23 officers. The Port Authority police lost 37. The FDNY's dead numbered 343. 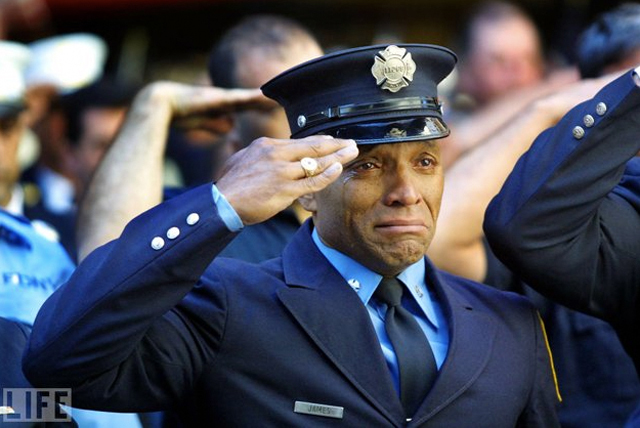 Here, firefighter Tony James cries while attending the funeral service for New York Fire Department chaplain Mychal Judge at New York's St. Francis of Assisi Church, September 15, 2001. 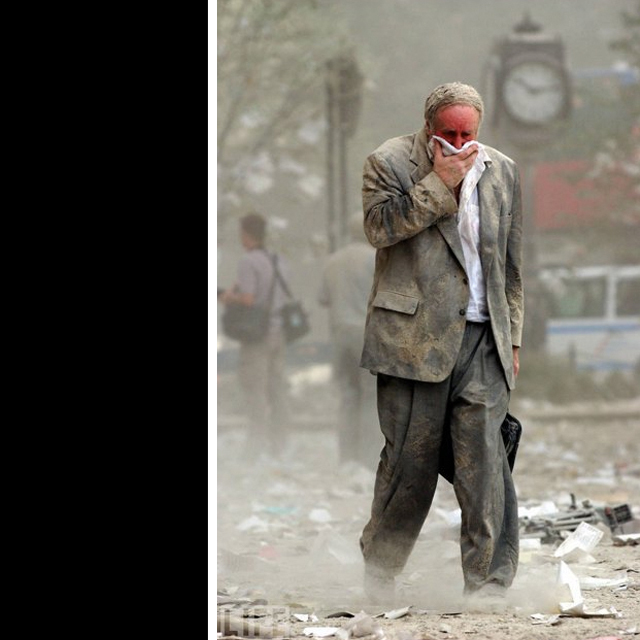 Photographer Joe Raedle, who attended and photographed funerals for weeks after September 11, told LIFE.com of this shot: "Anytime you see a fireman or a symbol of strength breaking down like that, it resonates." In fact, Raedle's photograph, with its ghostly echoes of James' salute surrounding his tear-streaked face, speaks to how millions of people around the world felt in the days and weeks after the attacks: namely, that strength was what we all needed most, and that it was the one thing that was hardest to find. where were you when the first plane crashed? how does this day in history affect you? i love to hear the stories of others. I was at work on the south end of Old Town, probably not far from where you were. From the conference room, we could see clouds of smoke coming from the Pentagon. I lived in DC proper, so I couldn't go home. I tried but instead ended up giving rides home to two strangers that stopped me on the Parkway, having just walked into VA from their offices in the city. It was bizarre and sad and all we had was one another. I was at home with Jack (who was about 1 1/2). 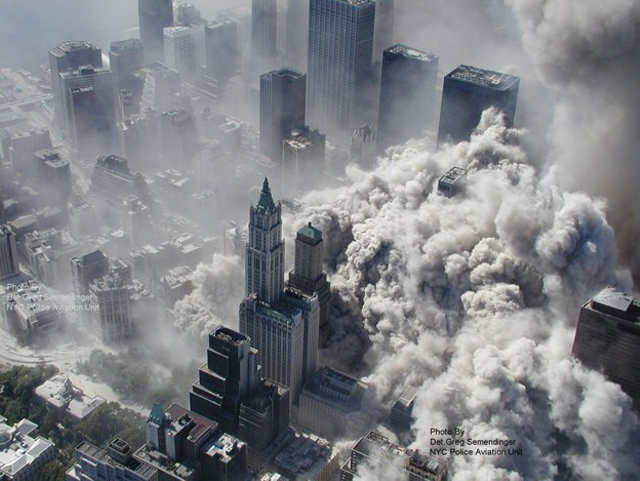 I remember turning on the TV and seeing the footage of the North Tower in flames and wondering how a pilot could NOT see that big of a building and as I watched the footage the 2nd plane hit and instantly being aware it was no accident. 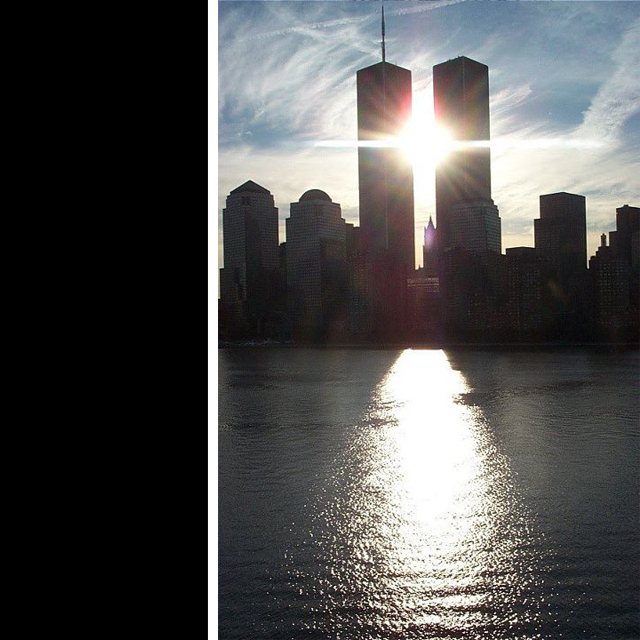 I remember holding Jack and praying for the city of NY and all the people in those towers. I was shocked as the 3rd and 4th planes hit and wondering when it was going to stop. Saddness and disbelief as the towers fell, knowing there were people in there that couldn't get out. I called Jared at his office and told him to turn on the TV. We just stayed on the phones not talking...but being together. 10 years later we still remember...we will never forget. My son was born 8/22/01 and I was home nursing him when my dad came to the door (he lived very close by). He told me to turn on the TV and while watching it I wondered what kind of world I had just brought my 1st child into. I am the above poster... just adding that this was on the West Coast so it must have been pretty early in the morning. Those pictures give me chills. Thanks for putting together such a poingnant, beautiful post. I was just bringing Angela (then 5 years old) to daycare when I turned on the car radio. "A plane has hit the World Trade Center...." It's a short drive to my friend/daycare provider's house. I ran in the door with Angela. Her daycare kids were watching Barney. Without saying a word I changed the channel on the t.v. My friend came out of the kitchen, and together we watched the second plane hit. Stunned. We were stunned and sobbing. (the kids were all toddlers, thankfully, who didn't understand what they were seeing on T.V. but these to women were really upset.) I remember looking at the buildings, and saying to my friend, "That building is leaning. Is that building leaning? They can't fall down, can they? I mean, buildings like that don't fall down. Can you imagine if it falls down???? OMg...how many people are in that building? Please God, don't let that building fall down." I had to get in my car and go to work. I didn't want to do it. I didn't want to leave the TV screen. But there was a class full of kindergartners who would be coming to school. If they came to school. Would schools close? We were under a terrorist attack. Where next? I got to work, and as I walked into the classroom the teacher had just gotten there and flipped on our TV...just as tower 1 fell. We were sick. Physically ill. 10 minutes before kids would arrive. Many of our kids didn't come to school that day. The ones who had were a mess. They'd been put on the bus by parents who were in shock. One little boy came who didn't know his dad was at a meeting in tower 1 that day. He was only 5 years old, why would he know? I don't usually write about items that I have issues with but just wanted to put a thought out there for you to think about. 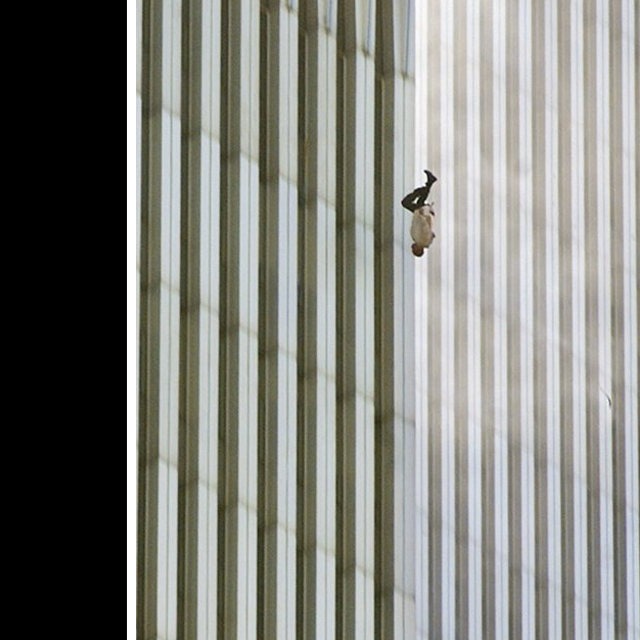 The photo of the man jumping from the towers....that is someones husband, son, father, friend. If that was your family member or friend, would you want that pic posted? I know that is the reality of the day and that pic it out there but seeing it just makes me sad for the family and friends of that person and the thought of that being the way he is remember saddens me. I'm not saying take it off, I just want to make sure you have thought about it that way. I LOVE your blog so I'm not trying to be all picky or overly sensitive....just a thought.